Consider the irony of it all. 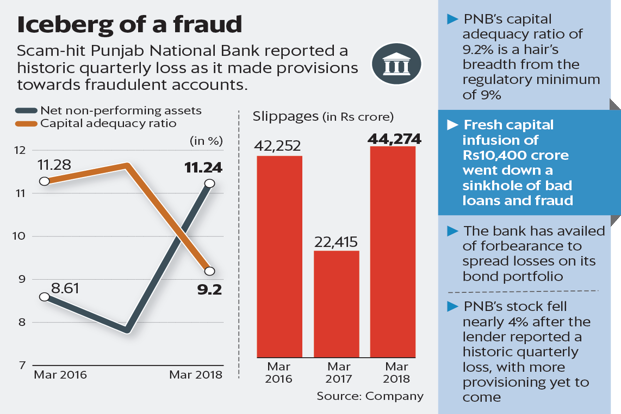 Punjab National Bank (PNB) promotes itself as a symbol of trust, but poor risk management and bad lending decisions have brought the lender’s capital adequacy within a hair’s breadth of the regulatory minimum. PNB’s capital adequacy ratio at the end of March was 9.2%, against the minimum regulatory requirement of 9%. And Nirav Modi isn’t entirely responsible for this. The bank provided a colossal Rs20,353 crore in the fourth quarter towards bad loans and fraud-hit accounts, but the Nirav Modi fraud accounted for less than two-fifths of this (Rs7,579 crore). The end of forbearance led to slippages of around Rs10,000 crore, and overall, fresh slippages excluding the fraud amount were 76% higher than the previous quarter. The upshot: the bank has no growth capital left, even after qualified institutional investors put in Rs5,000 crore and the government infused another Rs5,400 crore this fiscal year. Fresh capital essentially went down a sinkhole of bad loans and fraud. The lender also reported a quarterly loss of Rs13,417 crore, breaking its own record of the largest loss it reported exactly two years ago. As far as the Nirav Modi fraud goes, PNB paid Rs6,586 crore that it owed to other banks through the underwriting of letters of undertakings involved in the fraud. But as pointed out earlier, it would be a folly to attribute the immense pain on PNB’s balance sheet to just that one fraud event. The rest of the loan book is also deteriorating at a fast pace. Considering all of these large provisioning burdens, the lender had to take help of a leeway provided by the Reserve Bank of India (RBI) to spread out provisioning for bond portfolio losses. So, what should we expect in the coming quarters? Mark-to-market provisioning of Rs1,088 crore on the bond portfolio, remaining provision towards fraud of Rs7,178 crore and wage-related provision of Rs190 crore will be done over the next two quarters. In other words, the pain points for PNB are far from over. What’s more, the bank’s core income has hardly grown in fiscal year 2018 (FY18) and fell 17% for the quarter ended March. Its loan growth was 10% mainly due to retail loans. At a net bad loan ratio of 11.24% and a capital adequacy ratio of 9.2%, PNB qualifies to be put under the Scheme of Prompt Corrective Action of RBI. It reported a negative return on assets for FY18. The stock fell 3.8% in reaction to the quarterly results and it trades at a deep discount to its estimated book value for FY20. PNB may be the cheapest stock among large public sector bank shares, but it simply doesn’t inspire any trust among investors.